NEW CITY- County Executive Ed day held a press conference at the Allison-Parris County HQ Building to announce ongoing litigation against two businesses that defaulted on big dollar small business loans guaranteed by Rockland taxpayers. Pal Auto body in Haverstraw and still-to-be completed community center at 11 Remsen St in Monsey have failed to make payment since 2014 and 2009, respectively. Joined by County Attorney Thomas Humbach and the county’s auditor, County Exec Ed Day did not mince words when it came to his displeasure of County Legislators “flipping their votes” on the appointment of Dr. Penny Jennings to permanent Human Rights Commissioner. Dr. Jennings, former Human Rights Commissioner as of Sat. Nov. 19 continues to work in the county building under a different title in the community relations part of County Exec day’s office. County Legislators Ilan Schonenberger and Aron Weider grilled Dr. Penny Jennings in public session on July 26 about “a more even distribution of HUD monies” according to those at the meeting. Previously Day said their was more funding going to Ramapo. Hon. Michael Grant contends that at no time was the questioning about race and Grant did not believe Dr. Jennings should get a pass on being unable to answer all of their questions because she was newer in the position. 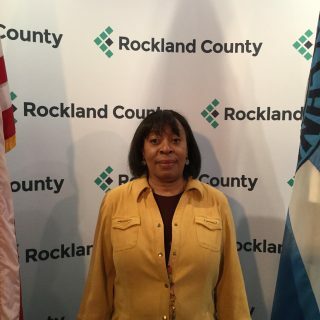 “This is unprecedented in Rockland County’s modern times…Dr. Jennings breaks the glass ceiling…I am going to have difficulty finding a more qualified candidate, not only for this position, but for any position if this is the way the County legislators conduct business,” said Day at Tuesday’s press conference. “An African American female with a doctorate in Law an policy…I can’t keep her because of some vague notion that she is not qualified..,” Day added. Day congratulated Dr. Jennings on completing work that the previous Human Rights Commissioner Ram Nagubandi failed to achieve. Day, once a County Legislator himself, said he would have been very outspoken about the three County Legislators’ sudden change in vote. Day did not comment on his plans to reappoint Dr. Jennings after the 60 day grace period, but he did say a Jennings reappointment would require the County Legislatures to vote in favor. Day said HUD investigators, DA’s office and County Execs office are all aware an ready to work in conjunction to continue investigating bad loans made to Rockland Business and depending whether the concern is county, state or federal the proper authorities will act. At this time Myrnia Bass-Hargrove is temporarily taking on the responsibilities of Human Rights Commissioner while retaining her position in Community Relations Dept. of County Executive office.